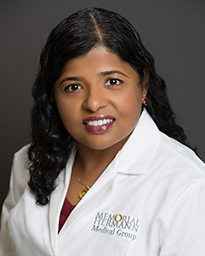 Elcy M. John, M.D., is an Obstetrics and Gynecology physician serving female patients aged 12 and up. Dr. John received her medical degree from The University of Texas Medical School in San Antonio, Texas. She completed her residency in obstetrics and gynecology at Temple University Hospital in Philadelphia, Pennsylvania. Knowledgeable in Malayalam and Spanish, Dr. John treats a variety of obstetric and gynecological issues, including well woman’s exams, abnormal bleeding, family planning, and pregnancy management. Her clinical interests include general obstetrics and abnormal bleeding. With a welcoming demeanor, she makes sure her patients feel comfortable by ensuring she is listening to their concerns and needs. Her favorite part about being a physician is delivering babies. In her spare time, Dr. John enjoys traveling, hiking, exercising, reading books, and most importantly spending time with her husband and two children. Dr. John practices at Memorial Hermann Medical Group The Woodland’s OBGYN. Elcy M. John, M.D., is an Obstetrics and Gynecology physician treating female patients aged 12 and up. Knowledgeable in Malayalam and Spanish, Dr. John treats a variety of obstetric and gynecological issues, including well woman’s exams, abnormal bleeding, family planning, and pregnancy management. Don't use your pregnancy as an excuse to ditch a healthy lifestyle. Dr. Yesenia Blancas, an OB/GYN affiliated with Memorial Hermann Memorial City Medical Center/UT Health said your caloric intake shouldn't change much during the first trimester…. According to Dr. Elcy John, an OB/GYN at Memorial Hermann Medical Group The Woodlands, the American College of Obstetricians and Gynecologists (ACOG), advises pregnant women to not let their core body temperature rise above 102.2 degrees Fahrenheit.